I had a pretty busy day yesterday, before it even got to half 10. Work was hectic, lots of changes and other boring stuff. Thought I'd do a little update with a few photos from my morning. 001 - I visited my Auntie's beautiful new house. 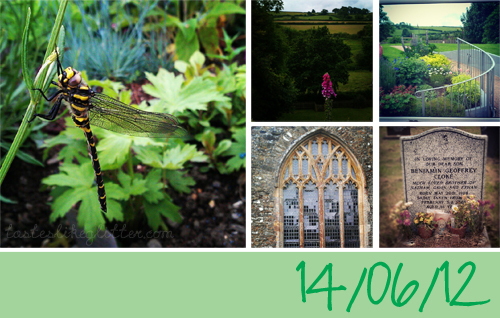 Whilst taking photos of the flowers in the garden, I came across this little dragonfly. I was quite surprised that the photo came out so well as s/he was getting blown about by the wind a fair bit and I couldn't keep my phone still. 002 - The gorgeous view from the top of her garden, not a building in sight. 003 - The view from the kitchen and conservatory windows. It's like a secret garden, full of wonderful, colourful flowers. 005 - I finally mustered up the courage to visit my first ever best friend. In the 7 years since it happened, I believe I've only been 3 times. I'm a terrible friend but everything about it scares me.